Rumour has it that a couple of figures were spotted on a golf course in Northern Ireland on Sunday afternoon. Chances are they were only out walking their dogs, though, for there was a powerful impression around the Old Course at St Andrews that every golfer in the province had upped sticks and moved to Fife. Even in this year of extraordinary feats by Northern Irishmen, the leaderboard at the Dunhill Links was a sight to behold. Michael Hoey was at the top of it at the end, but he had been pushed all the way by his compatriots Rory McIlroy and Graeme McDowell, who finished second and third respectively. Throughout a close and compelling battle, the one matter that was never in any doubt was where the winner would come from. Hoey, who shot a round of 68, pocketed a cheque for just over Â£500,000. For much of the day that money seemed destined for the bank account of McIlroy instead, but having raced into the lead by covering the front nine in just 30 strokes, the US Open winner shot 35 on the way home. McIlroy claimed his last birdie at the 11th; critically, Hoey struck three over the final four holes to move to 22 under par and win by two shots. Even so, McIlroyâ€™s charge was spine-tingling. Its highlight was an eagle at the third, when he holed his wedge shot from around 100 yards, and he also collected birdies at the second, sixth, seventh and nine holes. In fairness, the front nine is by far the easier half of the Old Course, but Hoey was under no illusions that his compatriot was applying the pressure. â€œI saw he was going really well,â€ said Hoey. â€œI just had to find a bit of rhythm. I donâ€™t get into what other guys are doing because I find that doesnâ€™t work for me. â€œI work with a sports psychologist and the mantra is always one shot at a time. McIlroy now heads off on a mind-addling schedule that will take him to the Korean Open this week, quickly followed by an exhibition match in China and the Grand Slam of Golf in Bermuda. From there, he travels to Istanbul to watch tennis for a few days, then back to China for another couple of tournaments. After which he gets two weeks off. The chief distractions from this Ulster parade were offered by Marc Warren and George Murray, two Scots who needed good finishes to secure their playing privileges for next year. Murray did so with something to spare, his round of 67 drawing him level with McDowell. 28 year-old, for whom growing up just down the coastline in Anstruther was no preparation for finding himself in such esteemed company on the first tee. 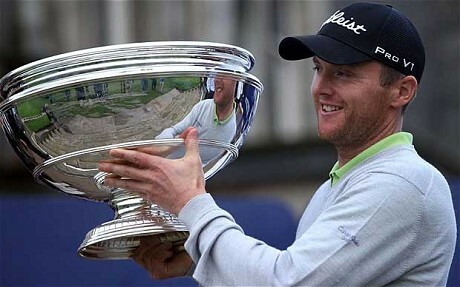 Warrenâ€™s 67 put him into a tie for fifth place with Louis Oosthuizen, the 2010 Open champion. The Glaswegian may still have to earn a little more to get back on tour next year, but nothing of the order of the Â£120,000 he collected here.